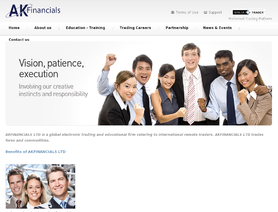 AKFinancials LTD is a global electronic trading and educational firm catering to international remote traders. AKfinancials LTD trades forex and futures . AKfinancials LTD offers a comprehensive 4 month online training program for forex and futures traders. The training program bridges the gap between seminar theory and real trading results with an emphasis on developing the trader's mental framework and trend-following techniques. The comprehensive course covers fundamental analysis, technical analysis, risk management, trading psychology, and shows traders how to develop a trading plan under the mentorship of experienced traders. The goal of AKfinancials LTD is to help you develop into a professional and profitable forex / futures trader through our course and mentoring. Hi, so no one has ever being offered an employment with AK FInancials LTD? I had an absolute nightmare with this company. 1) 'Education' on trading psychology is in the form of the trainer sending a PIRATED copy of 'Trading in the Zone' by the late Mark Douglas. I have contacted the rightful content owner to inform them of this IP infringement and can affirm that it is indeed pirated, since no genuine PDF copies of the book exist. Incredibly, the trainer accuses me of saying I BOUGHT (vastly different in a legal context) the pirated PDF from him, and that the content owner will have to 'pay' him. Seems pretty unethical to me. 2) The notes on building a training system are lifted right out of 'Technical Analysis for Dummies' by Barbara Rockefeller. Approx 2000 words of plagiarism. I then did a quick google search of entire paragraphs from their notes and found instances where they originate from free websites such as investopedia, deltastock and tititudorancea, to name a few. It's ridiculous to pay 1495 USD for a course and discover that so much of the materials can be available free or are plagiarized. Did I mention how outdated the notes are? For example it still says Bernanke is the Fed Chair. Even the notes on their own (I assume) proprietary trading methods require extensive markups to make them up to date. With such a lack of quality in material, do you still believe their ad which claims they offer the 'very best in support and training'? Secondly, the delivery of the lessons leaves a lot to be desired. Lessons are conducted on skype, which is fine. Skype has great features like voice calling, screen sharing etc, but none of those features is used. Going through charts together can be quite a pain. When I first spoke to the trainer, he told me he had problems with his mic. Two months later, at the end of the course, it was still MSN-style chat. The timing of the lessons can be highly erratic too. One week I had no lessons, another week I had 11 hours of lessons. And be sure you keep track of everything he promises to cover at the start of the course, because for my case he totally forgot about the topics on building a trading system and part of their risk management scheme, until I reminded him towards the end of the last lesson. My third gripe with this company is their lack of support when the demo month starts. As required, account statements were sent to the trainer every friday. When did the first feedback arrive? 1 month and 14 days after the start of the demo month. Enough said. Moreover, the trainer claims there is 'no way' to lose money if you follow his rules. This is strange, because anyone with a modicum of trading knowledge will know that trading always entails uncertainty. Even their contract agreement says 'the past performance of these systems and concepts may yield different results in the future'. So how on earth is 'no way' possible? And lastly, to all the Singaporeans out there thinking of whether to go for this course, the trainer told me he was planing to open an office in Singapore, at Robinson road, and that if you pass the course you qualify to be become an office trader for them. I am in contact with MAS and ACRA now in an effort to verify this claim. I suggest you do the same. 4. Lecture conduct over skype but no video conferencing. So only MSN style. Not very efficient especially when showing charts. AKFinancials course will take you from the beginning to the end for understanding of what forex market means. It will help you to understand price action, psychology of the market, intermarket analysis , indicators (how to use them). I really recommend this coaching. To begin with, I am new to trading and a recent graduate. My fascination with the markets began in my final University year and from then onwards I decided to pursue trading as my career. Totally oblivious to methods of trading, I bummed around on the internet, asked friends and read books, all in seek to gain valuable trading knowledge. I learnt many indicators through the web and traded on the simulator by mixing the various methods I acquired but something was lacking. It was someone who could provide advice, correct and be critical on mistakes made as well as provide guidance to start out even as a new trader. Someone who possess both patience and quality experience. Those of which I was lucky to find when I took up the AKFinancials course. Not only did I gain a good mentor but a friend and also many more which I met during my journey to acquire trading knowledge. As a new trader starting out in the challenging world of financial markets, the guidance and knowledge I gained upon completion of the course ranged from knowing the different types of trade orders, interpretation of the different types of information/data releases, to the psychological aspects encountered during/before and after trading. During the course, you not only learn various setups, receive books to tackle the psychology aspect of trading but also the support you will receive from your mentor is phenomenal. Asking questions can be the bane of many but here in the course with AKFinancials, you are encouraged. No matter how silly you think the question may be, it is always greeted with patience and answered as it should. My journey with AKFinancials was a pleasant and enjoyable one nevertheless. Not only did I gained valuable experience and knowledge but ultimately what I brought home were friends I made and the never ending guidance I received from my mentor and AKFinancials's trader. Even during my down time where I faced my first psychological downfall from trading, I was met with good advice and solid backing to rise up again. In all, this course was worth every penny. The constant struggle for more knowledge continues but a good stepping stone is important as well for the rather audacious journey ahead in the world of trading. That stepping stone, I am glad was from AKFinancials. This is a great course. They have about 5 strategies (trend-following).Their systems are easy to understand and if someone simply follows the rules, he/she will make consistant profits. I would recommend akfinancials training to anyone who wants to learn how to trade professionally. I've started trading on FOREX 6 months ago with one of the biggest brokers in USA (they say), very enthusiastic and confident that I will learn how to make money in the most liquid financila industry. But unfortunately as big as the broker is, the bigger my dissapointment was. They tempted me with low commissions, but the education and preparation for real trading were 0! Few online seminars presenting only the basics, few transactions on demo and then you are on your own! I've been through same situation like 99,99% of the traders, first months a lucky novice, fearless, unknowing in fact what exactly was going on, winning trades after trades. But the more I was trading, the more difficult began to be. In another month I lost all my profit and half of my investment. I took a brake to evaluate what to do next. I started reading more, observing the markets, and realized I knew nothing, that it is a complex work, which needs real preparation, personal and professional. Surfing the net looking for answers, i was lucky to find a smaller company, but with years of tradinf experience. Akfinancials has invested time and knowledge in me, and rised the hope inside me. They gave me the real education, although that meant reading and understanding hundreds of pages of books, and a lot of trading practice on demo. And not only that, they paid me to trade their capital. And all was worth it! Everything I've read on those materials, exercised on demo, then put in real practice on the real trading, showed rewards, for me and for them. I strongly recommned akfinancials for success! AK Financials has a great training program, but specially good is the fact that you have ono-on-one coaching, and trade real time with your mentor. the training covers from forex history to several trading techniques, use of indicators, money management, as so on...the works! I´ve improved a lot since this program. I strongly recommend you to take it, if you´re seriuos about becoming a succesful trader.